Last week I attended a health promotion conference in South Carolina. My flight book on the way there was David Kessler’s The End of Overeating. Kessler, a paediatrician by trade, and the former commissioner of the FDA responsible for tackling the tobacco industry, takes on his own lifestyle demon – something he calls, “conditioned hypereating” in his book, The End of Overeating. His premise is compelling. Big Food, over the course of years of trial, error, science and focus groups, have manufactured a food environment that for those susceptible, conditions like Pavlov conditioned his dogs - to overeat. Cues are everywhere. Packaging, smells, product placement on supermarket shelves, menu descriptions of meals, tenacious marketing – the world has become a Big Food marketer’s dream playground. Even the food itself has undergone hypereating evolution whereupon food has simply become fats, layered on fats, layered on sugars, layered on salts or some combination therein. In one of the most fascinating segments on food’s evolution Kessler discusses chewing. He quotes Gail Civille, the president of food consulting's Sensory Spectrum corporation who reported that in the past it would take roughly 25 chews before a mouthful was ready to be swallowed but now as a consequence of the processing and “pre-chewing” the average person only needs 10 chews to down a mouthful allowing that person to eat faster and outpace their body’s satiety cues in place of bursts of neuronal reward. The primary means to accomplish this “pre-digestion”? The inclusion of fat which makes swallowing easier. At one point Kessler talks with a food consultant who explains saliently that the hedonics of food involves five factors – anticipation; visual appeal; aroma; taste and flavour; and lastly mouthfeel and that mass manufacturing and processing allows the food industry to control these variables like never before with partial frying (to add a layer of fat), chemical inclusions to add aroma and flavour, and an exacting addition of the perfect amounts of fat, sugar and salt to “dial-in” irresistabilty. Consuming these foods causes conditioning because they're highly neurochemically rewarding. We learn that when we eat these foods we feel better, even if only momentarily, and in turn that will motivate us again and again to seek out those foods that our brain has recognized as positively reinforcing. The more the cycle repeats itself, the more ingrained the behaviour and the more the pattern becomes reinforced while at the same time our memory stores the cues surrounding the behaviour. If you have become conditioned to eat highly rewarding food in response to a fight with a loved one or a stressful day at work that ties together the reward with the situation such that when you have a fight with a loved one or a stressful day at work your mind automatically steers you towards food. In Kessler’s words, “Action builds on response and response builds on action” until eventually it becomes automatic leaving us with a cue-urge-reward habit. We’ve become conditioned to hypereat as the food we’re eating for comfort leaves its mark on our brains that leaves a void ready to be filled the next time we’re cued. 1. Figure out your cues. Food cues, situational cues, all of them. 2. Refuse everything you can’t control. 3. Create an alternate plan with a specific behaviour to adopt in place of what normally would be conditioned hypereating. 5. Remember the stakes. When faced with a situation that may involve conditioned overeating ensure that your visualization takes you all the way through to the inevitable end of the eating episode where you acknowledge that following momentary pleasure may come the pain of guilt or depression or the simple fact of it being counterproductive to your health. 6. Reframe things in terms of you vs. them. Kessler calls this active resistance. Recognize that Big Food is out to get you and try to see food in those terms. 7. Thought stopping. Try to stop your food related thoughts dead in their tracks. 8. Add negative associations to your normal cues. 9. Talk down the urge. Approach it with rationale thoughts. “Eating this will only satisfy me momentarily”, “If I eat this I’ll demonstrate that I can’t break free”. Ultimately Kessler’s premise is that Big Food created this mess, but that doesn’t abdicate our own responsibility to manage it. He likens it to alcohol in that alcoholics are often told that their disease is not their fault but it’s still their responsibility. Yet at the same time Kessler advocates for blind, overt, rule based restriction and deprivation as a means to treat conditioned hypereating. 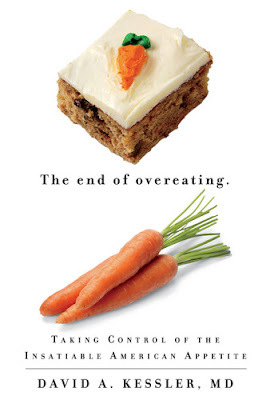 David Kessler's The End of Overeating is certainly a fascinating and engaging read, especially the sections on Big Food's engineering, but as a treatment plan I find it lacking. Like it or not the world has become one enormous Willy Wonkian Chocolate Factory and foods which help to condition hypereating are here to stay. To succeed with food in this world requires navigating the Chocolate Factory, rather than as Kessler suggests trying to avoid it. To paraphrase Nuval's Dr. David Katz, managing nutrition and weight today requires skillpower, not willpower. There's no amount of thought stopping or blind restriction that's going to change the fact that food is indeed pleasurable to consume and my belief is that the type of blind restriction that Kessler is suggesting will ultimately and eventually do exactly what he predicts - magnify conditioned hypereating. Zero tolerance as a dieting strategy has been around forever. If it worked, the world would already be skinny.